He’s the King of Thailand and he’s everywhere. King Bhumibol Adulyadej lives in Bangkok, but I can’t go far without seeing his photograph. There’s even a photo of him in my home. I put it there. The Thais’ attitude toward the king cannot be related to any relation in the United States. He is royalty and he is respected throughout the entire nation. It’s the law to do so, but it hardly seems necessary. The people love him. At a school library in a school near my village. His photograph is in every city. It greets you on the gate when you arrive. Every government building is equipped with a photo of him alone or with the queen. When I try to relate this to something in the states, there’s little I can think of. Occasionally you’ll see a photo of the current president in a government building, but it’s only there because it has to be. I think of old newsreel of the U.S.S.R. and the portraits of Joseph Stalin in the squares, but the king of Thailand leads by respect of the Thais, not fear. It’s not just the well off, either. The poorest pheasant loves the king. I have to rewind to the late 1990s Wisconsin to think of anything close to comparison. In that era, you couldn’t walk into a bar in America’s dairy land without seeing at least one photo of Brett Favre. Wisconsin residents worshiped the jock as if he could do no wrong. Even when he did do wrong, it was a lineman’s fault. But that love fell when Favre signed with the Jets and later the Vikings to show Packers fans his loyalty wasn’t as true as theirs. The King of Thailand has been in power longer than anyone on the planet. He’s been in power for 66 years – since 1946 – making him the longest-reigning monarch in Thai history. This is just a small portion of a wall in Ubon Ratchathani with paintings of the King. 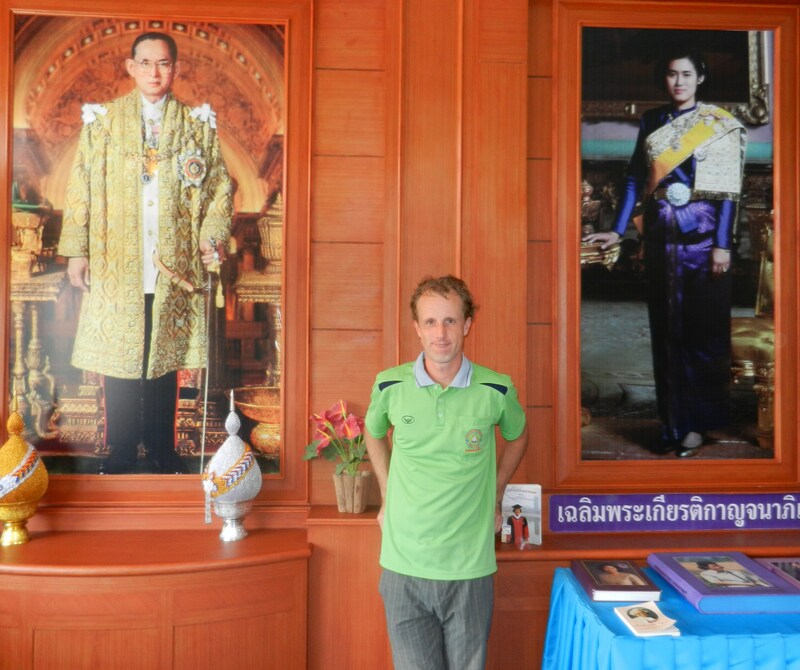 I had the privilege to meet his daughter, Princess Maha Chakri Sirindhorn, a few weeks ago. Well, I didn’t personally meet her, but she came to the celebration of Peace Corps Thailand’s 50th anniversary. She walked into the auditorium, everyone stood and bowed (the women curtseyed). Thanks were given by the U.S. Ambassador to Thailand as well as the Peace Corps Country Director. The princess then gave a brief speech (in excellent English) to everyone, thanking Peace Corps for its 50 years of service. She watched a video about Peace Corps with everyone complete with footage of John F. Kennedy, which always makes me choke up. After the ceremony, she had her photo taken with two groups of 30 volunteers. I, unfortunately, did not have my name drawn to be in the photo. If I can make it to 84, perhaps I’ll make it in the photo for the 100-year anniversary. 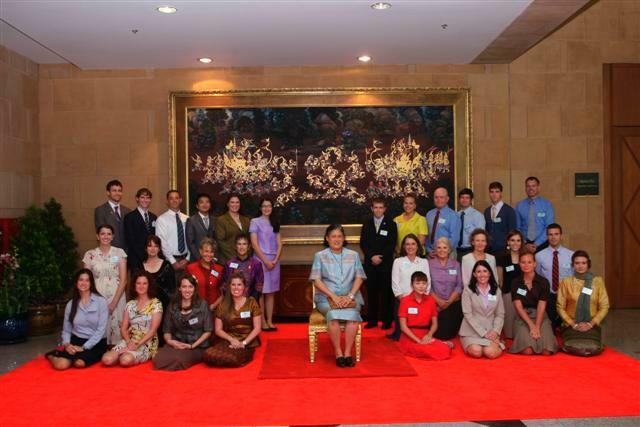 The Princess of Thailand with volunteers from group 123. If hosting the princess wasn’t enough excitement, there were also Returned Peace Corps Volunteers (RPCV) from group one (1962) to the present. I was fortunate enough to speak with a number of them including Nancie McDermott, a woman who served in Surin from 1975 to 1978. Of all the festivities, speaking with the RPCVs was the most rewarding. I suppose it’s the equivalent of a soldier speaking to a Vietnam War veteran. 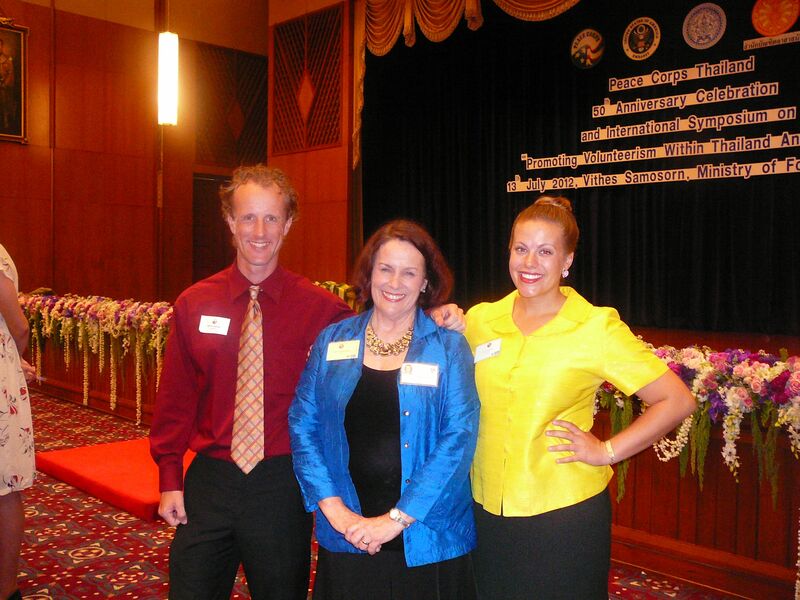 With Returned Peace Corps Volunteer Nancie McDermott and my Surin buddy Christine. This entry was posted in Peace Corps and tagged brett favre, peace corps, thailand by Jeff Jackson. Bookmark the permalink.